If you are not already familiar with our Petunia, here’s a link to her blog. Just copy and paste. Sorry. I first made the acquaintance of Petunia when she found out that her bio-sister was a heavy metal listening, tattooed, Satan worshiping, bar tending, potential vampire. I, of course, took it upon myself to defend Vampira Jr., and this lead to a spiffy little exchange on my blog. I don’t hold any animosity toward Petunia, in fact, in light of recent discoveries, I feel a bit sorry for her. As you know most of us don’t blog under our real names, Petunia is no exception, she has used a very common device and bogs under her birth name. Petunia. Kind of an odd name isn’t it? I began to wonder why someone would give their child that name. It must mean something. I had a feeling I had heard a name similar to that somewhere before, but I just couldn’t put my finger on it. Petunia must surely be the lost birth sister of Hyacinth Bucket. It only makes sense, Hyacinth, Rose, Daisy, and of course Violet with a Mercedes and room for a pony, all sisters, but there must be just one more, our Petunia. Petunia must be the result of one of Daddy’s adventures after the war. He had a brilliant mind, you know, I’m sure he was quite one with the ladies. A young woman could easily be drawn into a tryst with such a man. I have no doubt that Petunia was adopted to keep shame from Daddy’s name, and that of the love struck young girl who had feel for his charms. The family never speaks of it, of course. 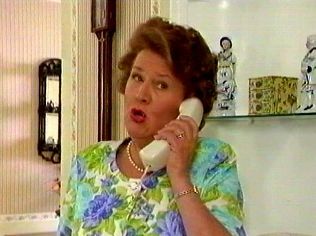 Did Petunia ring up Hyacinth on her white slimline telephone? Was she rejected or asked to a candle light supper, or possibly a nautical buffet? Has she met her nephew Sheridan? Would Hyacinth serve her on the Royal Doulton with blue periwinkles? One thing is for sure Hyacinth and Petunia would share an opinion of Onslo’s vest. The show is called “Keeping Up Appearances”, folks. Why is it that adoptees records always seem to catch on fire? The phenomenon disturbs me deeply. I don’t know how many times an adoptee has told me that someone has told them that their records burned. In fact it happens so often, I wonder if we a dealing with some type of recurring event. I was told my own records burned. A very nice lady told me that the hospital I was born in had burned to the ground in 1968. The thing is, I don’t live that far from that hospital, I had driven by it many times. It appeared to me to have been standing for at least fifty years. Never the less, I searched newspaper records and didn’t find a thing. I saw reports of a couple of house and barn fires in my birthplace that year, but not the hospital. Considering I was born a town of about 2000 people, one would think that a hospital fire would be a big event. I know in my own little town it was news for weeks when a cigarette left in a stack of Styrofoam cups ignited the Gas And Grub convenience store, it made the TV news and everything. But small town newspapers are more known for wedding announcements and high school sports scores than hard edge reporting, So called up the local library and asked the lady who answered the phone if there had been a fire at the hospital. She had been born in the same hospital as me, and was about ten years older, she didn’t recall a fire. Her Uncle had been the Volunteer Fire Dept. cheif during the 60’s and 70’s and she promised to ask him for me. I called her back the next week, he didn’t know about any fire at the hospital. He had, in great detail, described a fire in a hatchery that happened about that time, but we agreed that probably wasn’t helpful. I called the nice lady at the hospital back. Under questioning she revealed it wasn’t the WHOLE hospital, just the records room. Well maybe not the WHOLE records room, just a cabinet. Maybe it was just the birth records. She reallty wasn’t sure. This would be almost amusing, if I were the only one, but I’m not. Not by a long shot. I can only conclude that something else is at work here. As we all know, none of these people would lie, and may, in fact, be in danger if they handle this records regularly. Imagine if your job involved working with object that appear completely safe, but had potential to spontaneously burst into flame at any moment. Wouldn’t you want to know? The people that work at hospitals, adoption agencies, and State departments of health, need to be warned. They could so easily be disfigured or even killed by burning adoption records. There needs to be some type of safety procedure put into place. At the very least all adoption records should bear a sticker warning the handler that they are flammable. If the government was aware of this potential danger to it’s employees, I have no doubt that they would take quick action. That is why I ask you to alert your state and local authorities of this danger, immediately. Ask them how many more people need to be hurt by incendiary adoption records.